By 1980 car performance had hit a new low. Engine displacement and horsepower had dropped across the board throughout the 1970s. There were only a few remaining performance cars available in the U.S. market. If you count performance oriented 2-seat sports cars the Corvette was pretty much the only American made game in town. There were a few exotic European sports cars however their high prices made them out of reach of a large majority of buyers. There was a ray of hope for the 1981 model year. 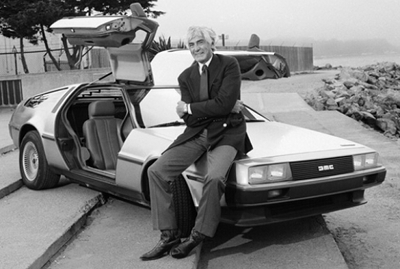 John DeLorean who had a whole string of successes in his career at GM which included such cars as the Pontiac GTO and Firebird, left GM to start his own car company. His dream was to produce the ultimate 2-seater sports car. His vision was to produce a state-of-the-art sports car that would be the envy of the world. The car was the DMC-12 which after spending several years in the design phase had matured into a beautiful rear-engine sports car with gull-wing doors. The body was stainless steel which wa s rustproof, an innovative idea. The bare stainless steel gave the DMC-12 a natural silver appearance. It was a big gamble for DeLorean not to have offered the DMC-12 in other painted exterior colors. It would have also been neat, had DeLorean offered a polished stainless steal version, imagine an entire car body that shined liked chrome. 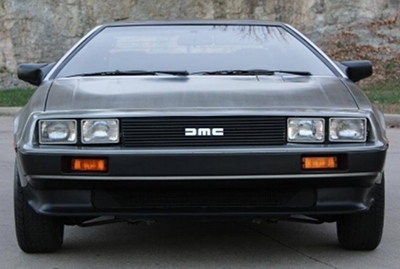 The rear-engine Delorean DMC-12 was originally slated to have a MSRP base price of $12,000. For 1981, this would have made the DeLorean one of the best 2-seater car deals around. As a comparison, the base price of the 1981 Chevrolet Corvette was $15,248. Unfortunately the DMC-12’s price would double to $25,000 by the time production began. Even with the price increase the DMC-12 sold well, the car was in high demand. Initially the DMC-12 was showered with praise. So what went wrong, why did the DMC-12 fail? Production for the DMC-12 would end in December 1982. The answer that most are given is that John DeLorean ran out of money and wasn’t able to secure financing to continue operations. This is partially true, but this isn’t the root cause of the problem. It wasn’t quality control issues either. There were minor issues during the first year but no more than any first year of a new car, by the 1982 model year those minor problems were fixed. Ironically the big gamble of building the DMC-12’s factory in Northern Ireland had worked. It was only the financial woes by late-1982 that forced the DeLorean Motor Company into bankruptcy. Not helping matters is that the U.S. which was the main market for the DMC-12 was on the receiving end of a terrible economic recession. It was at this time when John DeLorean was arrested on drug trafficking charges which he was later acquitted of. Thereafter his company was sunk like the Titanic. The root cause of the DMC-12’s failure was the lack of a true performance motor. The PRV 2.8 liter V6 which was a motor developed by Peugeot, Renault, and Volvo was the DMC-12’s only motor. It was a reliable and proven motor but it was ill equipped to power a sports car. The net result was the DMC-12 sold in the U.S. market went 0-60 mph in 10.5 seconds. This was very slow for a 2-seater sports car. The truth was the DMC-12 needed at least 200 horsepower to compete with other 2-seater sports cars in its market segment, the PRV V6 only produced 130 horsepower. As a comparison the 1981 Chevrolet Corvette produced 190 horsepower and went 0-60 mph in 8.1 seconds. Other competitors of the DMC-12 were the 1981 Ferrari 308 GTSi, it went 0-60 mph in 7.9 seconds and the 1981 Porsche 911 SC which went 0-60 mph in 6.6 seconds. That wasn’t the worst of it for the DMC-12, it only could obtain a top speed of 109 mph. As a comparison the 1981 Ferrari 308 GTSi had a top speed of 149 mph. Unlike most sports cars at the time The sleek aerodynamics of the DMC-12 could handle at least 150 mph. John DeLorean understood this was a big prob lem and had planned for the introduction of a new twin turbo V6 for the 1984 model year. If this would have happened the DMC-12 would have went 0-60 mph in 5.8 seconds and had a top speed of a little over 150 mph. No matter how beautiful the DMC-12’s styling was or how very cool it looked, these factors could not make up for the grossly underpowered motor under the rear hatch. This is why sales tanked by the 1982 model year. Even during the hard hit recession times of the early 1980s, powerful sports cars still sold. 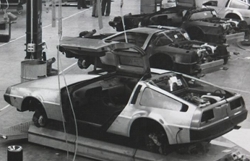 Had the DMC-12 started its production with a 200 or more horsepower engine, the DMC-12 would have been successful and the DeLorean Motor Company would have surely survived. In the end, it’s very ironic that the man responsible for the Pontiac GTO didn’t realize that every successful 2-seater sports car needs a good performance engine. If it had not been for the Back To The Future film trilogy, the Delorean DMC-12 would have been forgotten by most, instead it’s become a legend. The DeLorean Motor Company returned from the dead in the mid-1990s and still provides parts and upgrades (which includes engine performance upgrades) to current DMC-12 owners. And for the first time since DMC-12 production shutdown in late-1982, the DeLorean Motor Company will began production of a new DMC-12 sometime in 2017, it will have a modern V6 which will produce anywhere from 300 to 400 horsepower. Finally the DeLorean DMC-12 will get the motor it has deserved all along.